German and Austrian players looking for a safe payment method to transfer funds to an online casino should consider Giropay, an online payment service available exclusively to German and Austrian residents. Giropay is an online payment service designed especially for Germans. It allows users to transfer funds online directly from their Internet banking accounts, without having to reveal banking information to the online vendor. It works in a similar fashion to the Euteller payment service available to players from Finland, and iDebit which services various countries including Canada, Germany, Australia, Spain, New Zealand and South Africa. 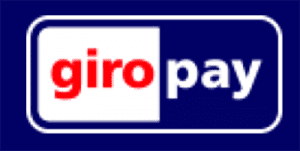 Giropay was established in 2006 and has become a highly trusted and respected financial service product in Germany. Within one year of operation, Giropay had already processed over €100 million worth of transactions and today that figure is €1 million per month, as Giropay has grown to service over 17 million customers. It is now the second most popular payment method used in Germany, behind Sofort Überweisung. Giropay works in conjunction with over 1,500 German and Austrian banks. Giropay is available at many of the leading online casinos, and all you need to use this payment service is a registered online banking account with one of the 1,500 compatible German and Austrian banks (there are talks of Giropay expanding this service to other countries in the future). Sign into your online casino account and go to the casino’s banking/cashier section. 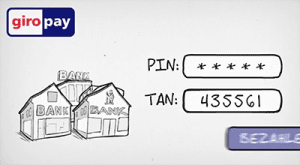 Select Giropay as your chosen deposit method and you will be prompted to select your bank from the available list. You will be redirected to the standard login page for your Internet banking account where you enter your user name and pin number as per usual. You will also be required to enter a TAN number (which the bank will send you via a remittance slip) to confirm the transaction, or using a 2FA (two-factor authentication) token if your bank provides that service. The bank will process your transaction on-the-spot, deducting funds from your selected bank account and transferring the money directly to your online casino account. You will be redirected to the casino’s banking page with a confirmation the payment has been successfully processed. Giropay money is available to use instantly, so you can start playing your favourite casino games for the chance to win real cash straight away. Can I withdraw casino funds using Giropay? Giropay can be used for withdrawing money from an online casino, provided the service is offered by the casino vendor. If Giropay is available, you can cash out your winnings in the same way as described above, with your money going directly back into your nominated bank account. If Giropay isn’t available for withdrawals, commonly accepted payment alternatives include Visa, MasterCard, web wallets and direct bank wires. Does Giropay cost money to use? The biggest downside to using Giropay is it is not a free service. Transaction fees apply to every payment processed through the Giropay system. All payments are subject to a €0.08 processing fee, in addition to a transaction fee which differs depending on which bank you are with. Transaction fees typically range between 0.9% and 1.2% of the amount of money you are transferring, with costs decreasing the higher the value of your payment, so the more you deposit, the lower your fees will be. Because Giropay transactions are processed through your Internet banking account, all payments are protected by the high levels of security used by your banking provider. The level of protection varies depending which bank you are using, but online financial institutions use some of the highest levels of digital security available. These security measures on top of the minimum of 128-Bit SSL digital encryption security used by our recommended online casinos means you can deposit real money to your casino account safely with the peace of mind in knowing your payments are protected. Giropay has the added benefit of being completely anonymous, as none of your payment information is stored by the casino or Giropay, so there’s no chance of your information falling into the wrong hands further down the track. When playing real money casino games online, it’s important to be aware of the online gambling laws applying to players from your country. To learn more about Germany’s online gambling laws and for a full list of the top-rated casino sites accepting German players, read our guide to German’s online gambling laws here.